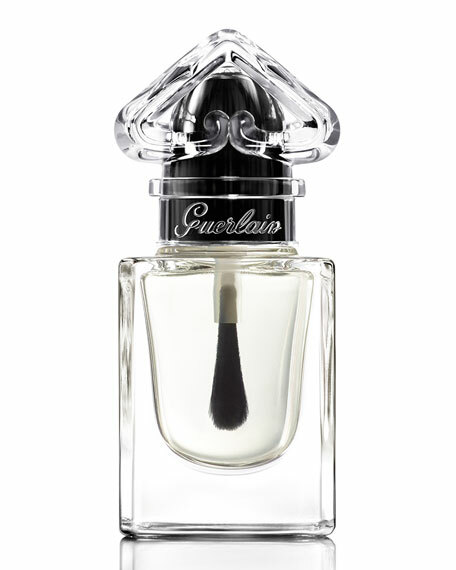 Guerlain creates fragranced color and imagines an absolutely essential and utterly irresistible La Petite Robe Noire* Nail Color in deliciously shiny texture to dress up your style with Color! A real La Petite Robe Noire miniature perfume bottle with its lid in the shape of the famous upside-down heart. Its flat brush allows optimal, easy and precise color application. An ultra-shiny finish and revived shades thanks to a new technology of ground pigments combined with a new generation of plasticizers. A floral fruity fragrance revealed just after application. Transcend color and get an ultra-shiny finish with La Petite Robe Noire Top Coat. Prepare your nails and boost hold with one layer of La Petite Robe Noire Base Coat (sold separately). Add color with two layers of La Petite Robe Noire Nail Color (sold separately). Reinforce and get an ultra-shiny finish with one layer of La Petite Robe Noire Top Coat. For in-store inquiries, use sku #2154013.